Canadian Fijian footballer, Nicholas Prasad. 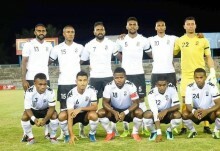 FACANADIAN Fijian national football defender Nicholas Prasad owes Fiji Football Association gratitude for giving him an opportunity to represent the country. Prasad, who returned to Vancouver last Monday, said he is ever indebted to FFA president Rajesh Patel, CEO, Mohammed Yusuf and coach Christophe Gomel. “I’m very grateful to be able to play for Fiji”, he told Sportsone. “President, Rajesh Patel, CEO, Mohammed Yusuf and Coach Gamel played a huge part in making this happen. I can't thank them enough”. Prasad becomes the first Canadian born footballer to represent the Fijian national football team, said the sport is changing in Fiji and he is happy to be a part of the change. “The landscape of Fijian Football is changing. It's growing very rapidly, and I’m happy to apart of the movement”. Prasad said he doesn’t know what the future holds with the Fiji national football team as he is more focused on European footballing career. “At the end of the day, it's out of my control. That's a decision coach Gamel and the rest of the coaching staff will have to make, I hope I’m part of the squad moving forward but for now it's European football". He has had district offers to play local football but refused as he is focused on European career. “I haven't considered any of the offers. I’m thankful for the districts' interests in me”. Prasad had a great time in Fiji and with the Fiji national football reps, said it was a proud moment to share the very field with Wellington Phoenix’s star striker Roy Krishna. “It was an incredible experience. “Roy's a great player, but more importantly a better person. I had heard a lot of football stories about him growing up, so sharing the field with him was a proud moment for me”. The SpVgg Bayreuth footballer is spending some quality time with family in Vancouver before he returns to Germany for his club football.